On Sunday, after returning from stripping cylinders in Chamberlain, I decided to embark on a journey up the Bad River. As I said above, the water is very high and I made it further upstream than I have ever before. I made it a full 4 miles upstream from the Bad River boat ramp... a full 0.5 mile farther than my previous record.Totaling 8 miles for the day. Last Friday, I was in Sioux Falls to catch the Wild Colonial Bhoys play at McNally's Irish Pub. Ryan Snuggerud met me there and we talked a bit and ended up doing a little game planning for the 2011 SDKC. Before heading back to Pierre on Saturday, I stopped at the Lake Vermillion State Recreation Area for a little paddling. Besides one fisherman, I had the lake to myself. First, I paddled from the boat ramp over to the bridge and into the small arm of the lake beyond. I then paddled up towards the dam (see picture below). I started to paddle up the north-south part of the lake, but the wind was blowing pretty good coming down the lake. After attacking the wind for a bit, I decided to head back. I would have liked to have made it up into the Vermillion River but I didn't want to wear myself out before the drive home. I think I spent about an hour on the water. 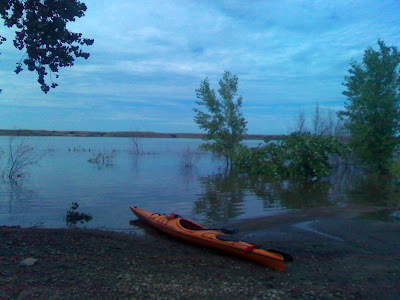 Yesterday, I went for a paddle around La Framboise Island. When I got to the boat ramp on the causeway, I discovered that the steel ramp onto the dock was underwater! It was a great day for a paddle. Not too much to report. Saw numerous ducks and startled one deer, a doe. After turning the corner around the island and heading back towards the causeway, I came across another kayaker. He was pedaling one of the Hobie mirage drive boats, probably something like an 8 foot model. Converting a canoeist... and eagles. Sorry that I haven't posted much lately. Beginning in August, I have been doing my field training for work and have been putting in 50-60 hours a week. The OT is nice, but my kayaking time is severely hampered. On Saturday, Chuck and took out a coworker of his that also happens to play ultimate frisbee with me on Wednesdays, Andy. Andy is an experienced canoeist and has done the Boundary Waters with his dad. Nothing too fancy, we did our bread and butter route around La Framboise Island. We did see quite a few immature bald eagles along the channel/chute alongside the island. Chuck and I went paddling this afternoon at Farm Island. We met at what is known as the boater's beach, which is near the main boat ramp. 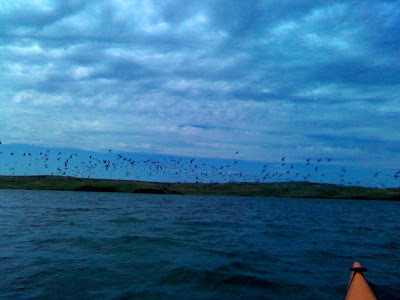 We paddled down to the entrance into the fingers/inlets into the interior of the island. We went up two of the fingers before heading back to the beach. Chuck used his sail a bit on the way down to the entrance and on the way out of the fingers. The water was very high and I did not notice near as many carp as the last time I was in the fingers. We ended up covering about 5.4 miles. 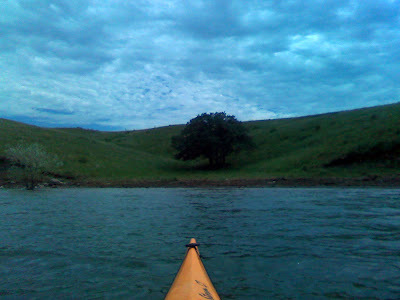 On Friday, Andy (my college roommate) and I went paddling with Dave Pfahler around La Framboise Island. Nothing too spectacular, just a routine cruise. The water level was very high though. Pretty much the whole dam/dike is underwater. I am also sharing a picture I took in Griffin Park. There is a RV club around town this weekend and it seems a lot of the members also have boats. I kind of liked how this one RV carried a kayak. My roommate from college had some vacation time to use or lose, so he decided to come up to Pierre for Oahe Days and to hang around for a week or so. On Saturday, we took in the free picnic at the Capital for the 100th anniversary of the Capital Building. There was roast beef and pork sandwiches, chips, cookies, and water. I then took him down to the river to give him some experience in a kayak before we tried a cruise. We just dinked about between Dump Island and the causeway. Came across numerous people I knew. We saw Chuck crashing his planes on shore, a coworker of mine tried unsuccessfully to enter his boat stereo into a car stereo contest... he would have won, in my opinion. And we also came across some friends of mine at the beach playing floating beer pong. On Sunday, I decided to take him up the Bad River. Apparently, the point John Adler and I made it too last summer/fall is the furthest point possible. The water seemed higher yesterday than last year, but we made it about the same distance. We pushed about 3.5 miles up, totaling 7 miles for the cruise. It was a dreary day today, but since there was no T-storms Chuck and I decided to go paddling. We met at the causeway at 1 PM. I was paddling the Storm GT and Chuck brought down his WS Northstar tandem. His girlfriend, Diana, was in town this weekend. Nothing too special, just a quick circumnavigation of La Framboise Island. The water level was high today, both boats made it over the dike structure without touching it. We also skirted up Capital Creek to the box culvert underneath a road through Griffen Park. Total distance was 5.9 miles. Today, I went out to what is called the boater's beach at Farm Island State Recreation Area. It is a sandy beach behind the East Campground (separate from the swim beach). Launching from the boater's beach, I headed downstream towards the channels into the interior of Farm Island. It is about 1.25 miles down to the point of entry. Once in, I took the time to explore all 4 fingers of the interior. I have done this numerous times, so nothing too surprising occurred. Numerous small birds were about. What I believe are carp always seem numerous in the channels, but today there seemed to be a greater than normal population. There were points where I could see dozens of fins sticking above the water and there were splashes all along the channels as I passed by. A few even splashed close enough to get water on my spray skirt! I covered 6.5 miles on today's outing. Quite a few pictures in the slideshow below. I had the interval shooting set to 45 seconds. One minute, thirty seconds is appearing to be a better setting for shorter outings. Yesterday my tandem managed to get wet. I took a couple more friends out kayaking around La Framboise Island. I was playing with my new Sticky Pod mount and the interval shooting mode on my new Pentax Optio W80 camera. I had the camera mounted to the side of the boat up near the bow. It held really well, but I need to lengthen the interval from 20 seconds to maybe a minute or 5... and probably half a hour for the SD Kayak Challenge. We stayed outside the channel alongside the island because the water was a bit low. We covered a hair over 6 miles. Nothing else too exciting to write about. Yesterday, Chuck and I took a couple of non-paddler friends of mine around La Framboise Island. I paddled my CD Storm GT, Chuck paddled his QCC 700X and my friends paddled my Perception Carolina 14 and Chuck's WS Tsunami 14.5. I also was playing with my new camera (Pentax Option W80) and mount (Stickypod). I setup the camera to operate on interval shooting, which allows me to set a time interval (i.e. 30 seconds) for the camera to take pictures until the flash card is full or a set number of pictures is taken. It is a very neat feature. We took our time around the island, stopping frequently to adjust the seats etc. in the borrowed boats and give a few tips on paddling, etc. We paddled through the channel/chute alongside the island... less than a hour ahead of us another couple of paddlers beached their boat, scrambled into the island, and captured more pictures of the moose (Yes, Dave P. was one of the two!). We did have to use our hands to propel us through the last little bit of the channel/chute. When we got to the dike structure, the water was too low to get the fiberglass and carbon/kevlar boats across, though I went over and back in my plastic boat. So we headed out into the main channel and back around the end of the island. As we were coming around the end of the island, through the main channel, apparently a fishing tournament was ending. 20+ boats started coming through the narrow channel at the end of the island. The water got rough and we had to stop to bail some water on the borrowed boats. Luckily, once we got past the end of the island, the water turned to glass and the rest of the trip was uneventful. Well, besides my camera battery dieing, a function of interval shooting I believe. I then spent a little time paddling backwards! This trip was probably the longest it has ever taken me to go around the island, but it was still a blast just to introduce non-paddlers to the sport. We covered 6.5 miles. Well, after the gale like winds of the weekend and the forecast winds for Tuesday and Wednesday, I decided on Sunday evening that I would paddle around La Framboise after work on Monday. To add a new twist to what is becoming a mundane paddle for me, I invited some "non-paddler" friends to come along; I also invited another Pierre paddler that I have been trying to paddle with to come along too. I loaded all three boats onto my rack and proceeded to the causeway at 6 PM. For various reasons, all of the "non-paddlers" bailed on me. But Sol B., a SD Dept. of Environment and Natural Resources engineer and fellow Pierre paddler joined me. Once I realized who he was a month or so ago, I have been trying to get him out on the water with me. We started out by leaving the causeway and heading up to the bridges. Sol had a fishing rod along and wanted to see how well the fish were biting. There were numerous fishing boats out along the west shoreline, but Sol didn't get any bites as we floated past. So we continued on towards La Framboise Island. Obviously, I was paddling my (still new) Current Designs Storm GT. Sol was paddling a Perception Eclipse. He also has a Perception Carolina, but the older 14.5 ft. model rather my newer 14 ft. model. The picture above may be the first time I have caught a train crossing the railroad bridge; I was pretty stoked. Also, I am using my new camera, a Pentax Optio W80. We ended up covering 6.8 miles and had a great time. I am loving having a smaller camera out on the water too! I do plan on trying to get the some of my "non-paddling" friends onto the water again, probably sooner rather than later too. The forecast must have been enough to deter most paddlers, because only 7 paddlers showed for the South Dakota Canoe and Kayak Association's kickoff paddle/Earth Day cruise. We had a little rain early on, but were greeted with sunshine and blue skies for most of the cruise. We put in at the pow wow grounds north of Flandreau, SD. The small rapid/ripple that is normally there was completely submerged today. The banks, as normal, were quite muddy. We took out just above the low head dam in Flandreau proper. We covered just shy of 9 miles by my gps. It was a very enjoyable cruise. Lots of discussion of the upcoming SD Kayak Challenge too. See you on the water! The winds around Pierre finally decided to subside today. I sent an email out to the Pierre Paddlers email group, consisting of three other paddlers around Pierre that I know and three identities I have no idea who they are. I also sent an email to a paddler that should soon be adding himself to the email list. The plan was to meet at the causeway at 6:30PM for a La Framboise circumnavigation. Only Dave P. was able to make it down. We took one of the most leisurely cruises around the island I have ever had. I normally try to work on speed. We came across two different groups of young deer playing along the channel/chute that runs along the island. We also saw a pair of bald eagles in a tree (and nest). But, alas, we did not get a glimpse of the La Framboise moose. When the winds calmed down yesterday, I was too tired from my drive home to take the Current Designs Storm GT out for it's maiden voyage. Tomorrow is looking to be very windy, so I elected to deal with today's wind to get the boat wet. The temperature was in the mid 70s and the wind was ~20mph with gusts of ~30mph. I chose to launch from the gravel beach near the American Legion cabin in Pierre. I paddled into the wind down to Dump Island, came around the island and returned to the beach. I failed to turn my gps on when I first embarked , but I know from experience that it is roughly 4 miles. Once I had the gps on, I noticed that I was traveling as fast into the headwind as I could paddle my Perception Carolina 14 on a normal day. I fiddled around with the rudder a bit, but I felt more comfortable edging the kayak. I figure I will use the rudder in worse conditions or when I am too worn out to edge anymore. Chuck and I met at the causeway at noon today for a paddle. It was 40 degrees with the forecasted high to be over 50. It is 58 degrees as I type up this blog. The winds were calm and the sun was shining. First we paddled over to the Bad River for a look and it was flowing decent and was very dirty. We then continued downstream along La Framboise Island. We noticed a few people fishing from the shore of the island. A week or two ago, an ice jam on the Bad River broke and there was plenty of debris downstream from it. In the next picture, notice how low Chuck's boat is sitting in the water... more on that later. We continued down to the end of the island and turned around and headed back upstream since the other side is still frozen. There were a few times on the trip that either Chuck or I heard running water. On one of the occasions we discovered a "waterfall" coming down the west river bluffs. When we got back to the causeway, Chuck checked his stern hatch and found a fair amount of water! The gel coat repair he did last summer apparently didn't hold up. I didn't take my gps along today, but from past experience I figure we did between 5 and 6 miles. I had hoped for a glimpse of the fabled La Framboise moose. Best we could muster was a bald eagle. Click on any of the pictures to go to the Picasa Web Album to see more pictures. Last year, a fellow South Dakota paddler, Ryan S., went to the paddling expo in Madison, WI known as Canoecopia. He raved about it so much that I had to go with him this year to check it out myself. It was fantastic! Shiny boats, cool gear, and great presentations filled up the Alliant Energy Center in Madison. We both sat in many boats and both had favorites, Ryan liked the P & H Scorpio LV and I liked the Current Designs Storm GT. My favorite presentation was by Kevin Callan, a Canadian paddler and writer, that I consider the canoe version of Rick Moranis. He is hilarious. There was also a fitness paddling presentation from Olympian Greg Barton and a presentation of stand up paddle boarding. I am actually currently looking into making a CD Storm GT into my own boat :) Also, Folbot is having a 15% off sale until March 22nd. Any locals to the Pierre - Ft Pierre, SD area that happen to paddle kayaks, canoes, or whatever, please join the email group I set up through Google. John Adler has moved (though still trying to sell his house) to Hot Springs, SD to run a KOA campground. Instead of taking over his Kayak Club Yahoo group, I decided to create my own because I prefer Google and I liked the idea of including all paddle sports in the name. The idea is to share when and where you play to go paddling so other members can join you if they want.